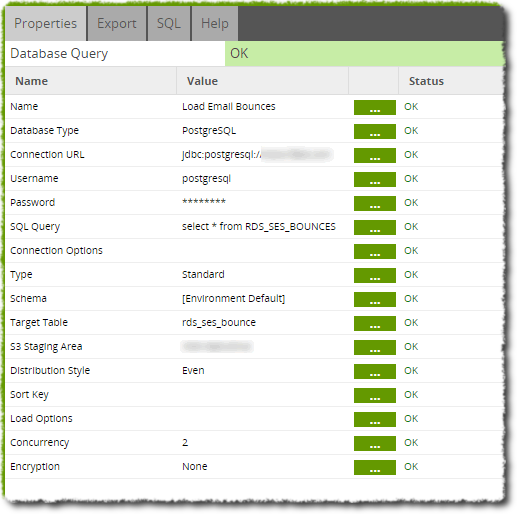 Run an SQL Query on an accessible database and copy the result to a table, via storage. This component is for data-staging - getting data into a table in order to perform further processing and transformations on it. The target table should be considered temporary, as it will either be truncated or recreated each time the components runs. Incremental loads using this component can be built using its Incremental Load Generator. Advanced - This mode will require you to write an SQL-like query to call data from your chosen database. Database Type Choice Microsoft SQL Server - see their website for more details. Oracle - see their website for more details. Sybase ASE - see their website for more details. PostgreSQL - see their website for more details. MySQL - see their website for more details. IBM DB2 - see their website for more details. IBM DB2 for i - see their website for more details. Netezza - see their website for more details. Teradata - see their website for more details. Note: For some databases, you must first provide a JDBC driver as not all drivers can be distributed with Matillion ETL. See this article for instructions on managing drivers. Connection URL Text This is the database JDBC URL used to connect. The format of the URL varies considerably, however a default 'template' is offered once you have chosen a database type. Replace any special tags in the URL template with real values. Although many parameters and options can be added to the end of the URL, it is generally easier to add them to the Connection Options documented below..
Username Text This is your database connection username. Password Text This is your database connection password. The password is masked so it can be set, but not read.Users have the option to store their password inside the component but we highly recommend using the Password Manager option. Combine Filters Choice And - Multiple filters must ALL be true for a row to be returned. Or - Any one of the filters must be true for a row to be returned. Limit Number Limits the number of rows that are loaded from file. Connection Options Parameter A JDBC parameter supported by the Database Driver. The available parameters are determined automatically from the driver, and may change from version to version. Value A value for the given Parameter. Parameters and their allowed values are somewhat database-specific. The links below may help, or if you upload your own JDBC Driver, consult the documentation that was provided with it. Please contact support support if you think you require an advanced JDBC option. Concurrency Integer The number of S3 files to create. This helps when loading into Amazon Redshift as they are loaded in parallel. In addition, Matillion ETL for Redshift will be able to upload parts of these files concurrently. Note: The maximum concurrency is 8 times the number of processors on your cloud instance. For example: An instance with 2 processors has a maximum concurrency of 16. Table Distribution Style Select Even - the default option, distribute rows around the cluster evenly. All - copy rows to all nodes in the cluster. Key - distribute rows around the cluster according to the value of a key column. Table Sort Key Select This is optional, and specifies the columns from the input that should be set as the table's sort-key. SSE S3: Encrypt the data according to a key stored on an S3 bucket. Primary Key Select Multiple Select one or more columns to be designated as Primary Keys for the table. Connect to the target database and issue the query. Stream the results into objects on S3. Then create or truncate the target table and issue a COPY command to load the S3 objects into the table. Finally, clean up the temporary S3 objects. In this example we connect to a source database that contains a table of records that indicate an email sent via SES had been rejected (bounced). The Database Query component is used to load data from the database into a table. In the Database Query component properties, we supply the URL to connect to our database and relevant credentials where they are needed. Data is selected for loading using an SQL Query. In this case, we take all data using a "select * ..." query. When running, the results of the query are copied to rds_ses_bounce which is reloaded each time the component runs. To confirm that our data is in the table (and to perform Transformations) we can use the Table Input component in a Transformation job. Using the Sample tab, we can take a quick look at the data to confirm the load was successful.